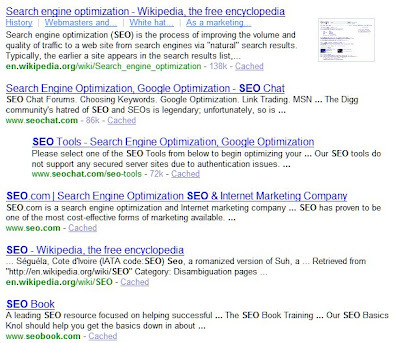 Where Greg Cryns (the elder) hangs out sometimes: SEO - is the page TITLE important? You betcha! One of the most important SEO expectations is to get people to click on your link in the search engines. This may not be as easy as it sounds. Think about how you search and what you decide to click on. Let's say you search for "SEO". Easy enough. Try it in Yahoo. I did that just now and came up with these results (after the first four that are ads but look like natural search results). Which would you choose to click on right now? They all look pretty good, right? Chances are that the information on all of these sites would be very good as well. So, you decision will be influenced by the headline that grabs you. Is that a fair assumption? Assuming that you know what Wikipedia does you may skip that one if you were looking for someone to do your SEO work. The rest look pretty much the same. So, it is likely that you would quickly skim the descriptions below the links to see if the results would give you someone to consider to do that work. If you are the business owner you are trying to influence your decision by using words, phrases and simple good copywriting techniques to get your attention. Pick me! Pick me! Efficient SEO people will try to make sure that each page on your site will scream Pick Me! Pick Me! Each title meta tag will be different on each page as will the descriptions. This works most of the time to tell the search engines what you want to say to the public. It does not work 100% of the time but often enough to make this good SEO practice. You may not be the #1 result found but your headline and page description may be all you need to beat out your competition. Check your own website now to make sure each page has its very own identifiers that could make all the difference to your business online. But remember getting click throughs is only the beginning. The page they click to needs to be optimized for whatever effect you want to occur. Do you want the visitor to join your email list? Do you want your visitor to make a decision to buy on the spot? Do you want your visitor to obtain good information from the page and help them to think of you when they are ready to buy? SEO is much more complicated than it was a few years ago when the job was almost entirely about good meta tags (that barely matter any more except for the title and description tags) and keyword placement. Finding and hiring a good SEO person is like finding gold in a California mountain stream. Hard to find but tough to beat, as the old ad goes. Most SEO people are not aware that what they are taught is not necessarily a fact. In fact, facts are hard to come buy in SEO since the search engines won't tell us much, if anything. Pretty much anecdotal or through experience on our own websites.